School started in Seattle last week. Hurray. Yippee. Yahoo. I’m not even going to try to contain my excitement as I now have two kids in school full time. After seven years of kids-all-the-time, it’s nice to have some time to myself to do whatever I want. My new–found freedom, combined with beautiful Seattle fall weather made pedaling around the city spectacular last week. I spent the first couple of school days riding my bike around North Seattle (Fremont, Wallingford, Ballard, Eastlake, South Lake Union). I made up all sorts of errands so I could spend as much time as possible away from the house. This summer I spent a lot of time in my little corner of Seattle (the kids rode on their own the majority of the time and still can’t ride very far so we stuck close to home). Needless to say it’s really nice to get out and see what’s going on in other parts of the city. I feel like I’ve been out of town for two months. There’s a whole lot of biking going on. I saw tons of fellow pedalers going about their business on two wheels. In Fremont, the bike racks are packed. School is about to start at the UW and it seems students got the message to leave their cars at home – they are getting around on bikes. There are also lots of bikers on Eastlake and in South Lake Union. It’s really encouraging to see so many people pedaling around . Of course, I forgot my camera at home both days so you’re just going to have to believe me. Things are not much different in our neighborhood. Lots of bikes out and about and taking up parking at the grocery store. Today I had to wait for a bike parking spot in front of my local grocery store. Not a bad problem to have so I gladly waited. It seems the momentum of last spring is continuing at school as well. 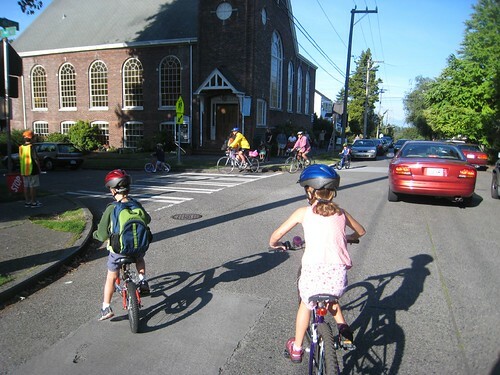 Biking–to–school is still as popular as it was last year. I even spotted a fellow Xtracycler at school last week (the only other one I’ve seen at our local elementary school). I had to snap a photo and talk to the owner when I figured out who she was). Yes – I’m still that crazy Xtracycle lady who evangelizes bikes as transportation to anyone who will listen. The PI reports that gas prices are the motivator for getting people to consider other ways to get to school. I think more people are realizing how easy and simple it is to get to school on a bike. What do you think? Have you noticed more bikers on the streets of your town? Hope to see you out there. Does anyone need me to run to the store? This entry was posted in alternative transportation, bigger than here, bikes, kids, seattle, sustainability and tagged bike-to-school, bikes, bikes as transportation, seattle. Bookmark the permalink. Hey there, Anne – I think it’s probably very important that you come have coffee with Tim and his colleagues sometime soon. I’d love to meet you! Please?? For me, the commuting by bike isn’t about gas prices at all – it’s about FREEDOM and taking the suckiest part of my day (driving to and from work) and making it the very BEST part of my day… that seems like a pretty dang good deal to me! Here in Bradford, MA we go to a small neighborhood elementary for K-2 and NOBODY rides to school, so when I show up on our tandem to pick up our youngest from Kindergarten at noon the kids all squeal with excitement and wonder at the strange looking bicycle! When my Xtracycle arrives I can get both the kids on it and then we will really get some strange looks! Can’t wait!!! Also, enjoying some freedom to ride alone to the local farm for produce with the kids in school! So glad to know there are other places in the country where people are picking up the biking trend though. In Richmond, Indiana I think the gas prices /are/ the primary motivation for people traveling on bikes and scooters more. It strikes me as a critical moment to provide more public education on how to use bikes as transportation comfortably and effectively, so people don’t get back in their cars their first chance they get. Ahh, I’m jealous. Mine are only 18 mos and 3 so we have a ways to go. I dream of days I can ride alone. But I’m also not ready to let them go quite yet. Thanks for all the great posts. I, too, am loving my son’s return to school…I’ve been riding almost every day for fun, and I can do projects around the house without little fingers getting into the paint or the hedgeclipper blades!